An intimate and intelligent romantic drama starring Felicity Jones and Guy Pearce, directed by Drake Doremus, Breathe In is released on DVD and Blu-ray by Curzon Film World on 7th October 2013. 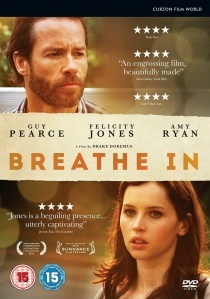 An intimate and intelligent romantic drama starring Felicity Jones (Like Crazy, Chalet Girl) and Guy Pearce (Prometheus, Lawless, The Hurt Locker), directed by Drake Doremus (Like Crazy), Breathe In is released on DVD and Blu-ray by Curzon Film World on 7th October 2013. An intimate and intelligent romantic drama from director Drake Doremus (Like Crazy), featuring captivating, career-best performances from Felicity Jones and Guy Pearce, Breathe In is a riveting tale of forbidden love that "resonates like a symphony" (Kirsty Leckie-Palmer, The Skinny).